See below for submissions related to international trade. The Australian Chamber welcomes the government’s efforts to review Australia’s unique soft power strengths and capabilities, delivering upon a commitment established in the 2017 Foreign Policy White Paper. The Australian Chamber and its member organisations believe there are many opportunities for the promotion and influence of Australian ideas and practices in the global community. As Australia’s leading voice for business and employers, the Australian Chamber is a unique member of the International Chamber of Commerce; [email protected]; International Organisation of Employers; Confederation of Asia Pacific Chamber of Commerce and Industry and the Silk Road Chamber of International Commerce. These platforms allow for Australian business to engage in global rulemaking in the intergovernmental bodies such as World Trade Organisation, the World Customs Organisation; the United nations, the International Labour Organisation, the Asia Pacific Economic Cooperation organisation, etc. The Australian Chamber, and Chambers of Commerce around the world, provide an essential service in acting on behalf of national Governments in efforts to simplify and harmonise customs procedures under the “badge of Government” authorisation related to the economic nationality of goods for the purposes of international trade. This essential service assists companies with international border crossing and should not be undermined. The Indian Ocean Rim Association has provided a platform for the Australian government to promote the empowerment of women and girls in the international trade facilitation. The Australian Chamber is uniquely positioned to deliver an ongoing IORA-related Women’s Empowerment Initiative. As the review into ‘Brand Australia’ continues, the Australian Chamber recommends that the government endorse the Australian Made, Australian Grown as the common brand and symbol. Additionally, Australia’s soft power is enables through the hosting of major international events. As such the Australian Chamber recommends that the government embrace the opportunity to position Australia as a host nation for these events. The Australian Chamber also recognises the impact that international students and international education programs can have when promoting Australian practices and culture, and recommends that education strategies be incorporated into our broader foreign policy. Finally, the Australian Chamber recommends that the government promote Australia as a diverse tourist destination, so as to spread Australian culture and values around the globe. The Australian Chamber welcomes the Government efforts to liberalise trade to the benefit of the Australian economy. We also appreciate that the Government has considered that a further inquiry into the this treaty is warranted given the recent passage of the enabling legislation for the CPTPP by the Australian parliament. 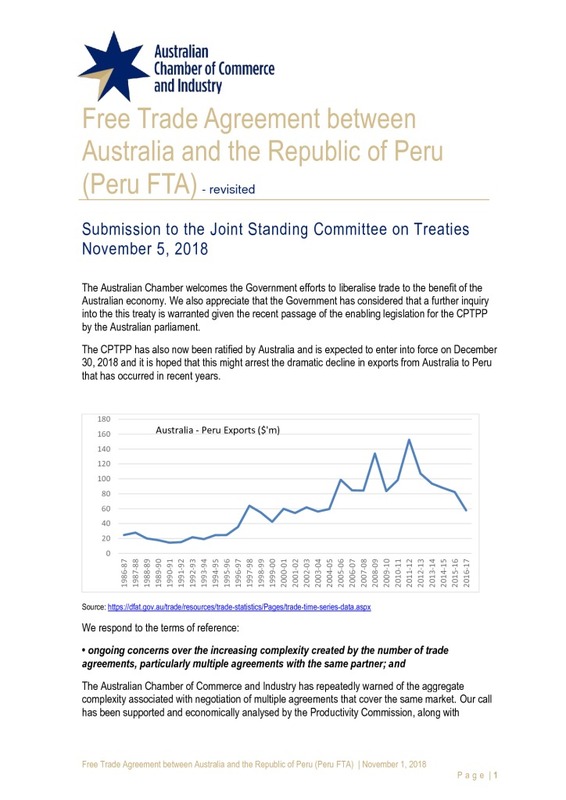 The CPTPP has also now been ratified by Australia and is expected to enter into force on December 30, 2018 and it is hoped that this might arrest the dramatic decline in exports from Australia to Peru that has occurred in recent years. 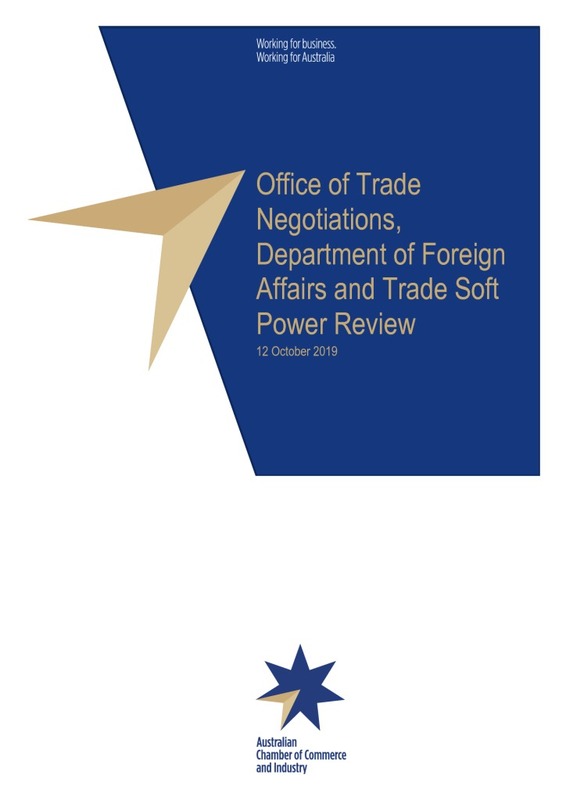 The Australian Chamber of Commerce and Industry welcomes the Office of Trade Negotiations review of Australia’s Soft Power capabilities. It is important for a government to review assets at its disposal, and evaluate strengths and weaknesses. Assessing Australia’s Soft Power capabilities has become more important as the world economy becomes increasingly interconnected, particularly through improving digital technologies. The 2017 Foreign Policy White Paper describes soft power as having “the ability to influence the behaviour or thinking of others through the power of attraction and ideas”. The Australian Chamber agrees with this definition, and identifies a number of key strengths of Chambers of Commerce that are at the disposal of the Australian government that will assist in this endeavour. The Australian Chamber welcomes and supports the government’s efforts to secure the Comprehensive and Progressive Trans Pacific Partnership (TPP11). It is a regional agreement with consistent rules and approaches that apply to a number (but not all) of our major trading partners. This consistency adds value to Australian business. This revised agreement offers significantly improved preferential market access for Australia into Japan and reduced barriers to entry into Canada and Mexico over current arrangements. It also provides benefits to Australian consumers (including businesses) through domestic tariff reductions, relaxation of investment scrutiny and will highlight Australia as a destination for tourists and students (although these benefits were available through unilateral reforms at any time without the need to negotiate trade agreements).